Designing a CPU in VHDL, Part 7: Memory Operations, Running on FPGA | "Domipheus Labs"
We already have a small RAM which holds our instruction stream, but our TPU ISA defines memory read and write instructions, and we should get those instructions working. It’s the last major functional implementation we need to complete. The fetch stage is simply a memory read with the PC on our address bus. It gives a cycle of latency to allow for our instruction to appear on the data out bus of the RAM, ready for decoding. When we encounter a memory ALU operation, we need the control unit to activate the memory stage of the pipeline, which sits after Execute and before Writeback. The way we want this implemented is that the ALU calculates the memory address during execute, and that address is read during the memory stage, and the data passed to the register file during writeback. For a memory write, the ALU calculates the address, and the data we want to write is always on the dataB bus output from the register file, so we connect that up to the memory input bus. The control unit is modified to add in the memory stage, and also take the ALU operation as an input to do that check. You can see the new unit here. Register File data input needs to be either dataResult from ALU, or dataReadOutput(ramRData) from memory – when a memory read. 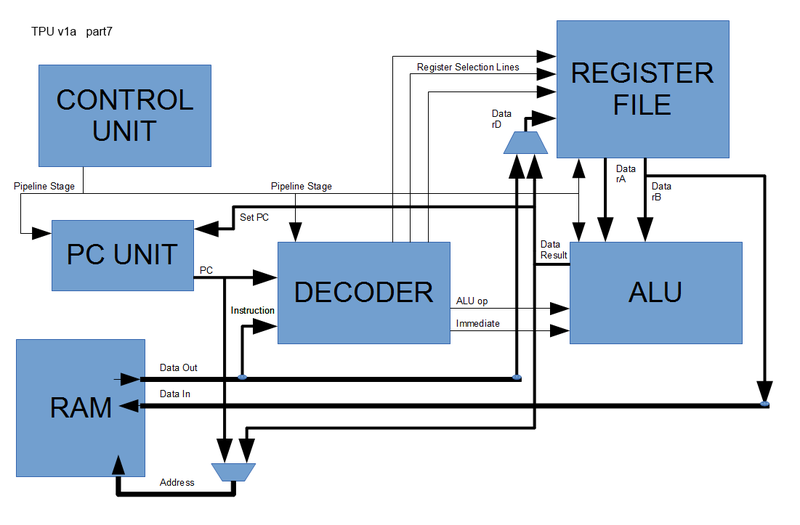 The Instruction Decoder needs connected to the dataReadOutput(ramRData) from memory, as the decoder only decodes during the correct pipeline stage, we don’t care that the input may be different – as long as the instruction data is correct at the decode stage. The memory write bit needs to know when we are performing a memory write instruction, and not a read. Memory writes also need to assign the dataWriteInput(ramWData) port with the data we need – contents of the rB register. The Address sent to the memory needs to be the current PC during fetch, and dataResult when a memory operation. We can try this without making another functional unit, by just doing some assignments in our test bench source. This means we expect to see 0x0000 in the memory location 0x0f after 6 iterations of the loop. From the waveform we can see computation finishes within the simulation time. We can go into the memory view of ISim and we see the result is in the correct place. This simulation works with one cycle of memory latency, when using our embedded RAM. If we wanted to go to an external ram such as the DRAM on miniSpartan6+, we’d need to introduce multiple cycles of latency. For this, we should stall the pipeline whilst memory operations complete. We won’t go into that just now, as I think we need to take a step back, and look at the top level view of TPU and try to get what we have on an FPGA. With everything built to date, we can see a pretty general outline of a CPU, with the various control lines, data lines, selects, etc. With this implemented as a black box ‘core’, we can try to implement our CPU in such a way that we can view a working test on actual miniSpartan6+ hardware. The miniSpartan6+ board has 4 switches and 8 LEDs. The top-level block I created has the clock input, the 4 switch inputs and the 8 LED outputs. I still used the embedded RAM. The code within this block resembles the test bench, except there is a process for detecting when the RAM address line is 0x1000 and writing the data to the LED output pins. I use one of the switch inputs to drive the reset line, which actually doesn’t reset the CPU – it simply resets the control unit. As our registers do not get reset, execution continues once reset is deactivated with some existing state present. As you can see, I use the first led to indicate the state of the reset line, which is useful. With this new top level entity, we can create a test bench and write a very small code example to write a counter to the LED memory location. 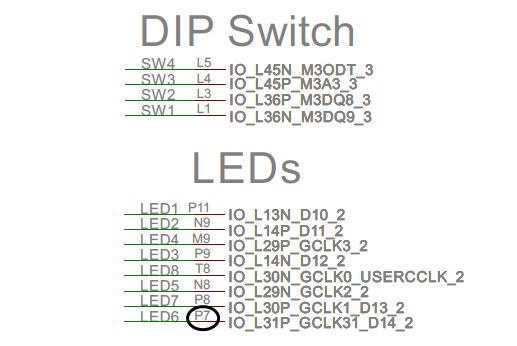 The code example below simulates and we see the LED output change. I force initialize the LEDs signal to a known good value as a debugging aid. Now we need to look at how we get this VHDL design actually onto the hardware. There is a great guide for getting the board running from Michael Field who runs the hamsterworks.co.nz wiki. You should give it a visit! The page in question is the miniSpartan6+ bringup. I use the exact same method to get the .bit programming files onto the FPGA. This method needs done every time you power the FPGA – it doesn’t write the flash, which would allow for the FPGA design to remain across power resets. Getting that working is for another day. As explained in the bringup guide, we need to create a ‘User Constraints File’ which at a simple level maps the input and outputs of our entity to real pins on the board. Looking at the miniSpartan6+ schematic we can see what pins are connected where, for example LED6 is connected to the ‘location’ P7. 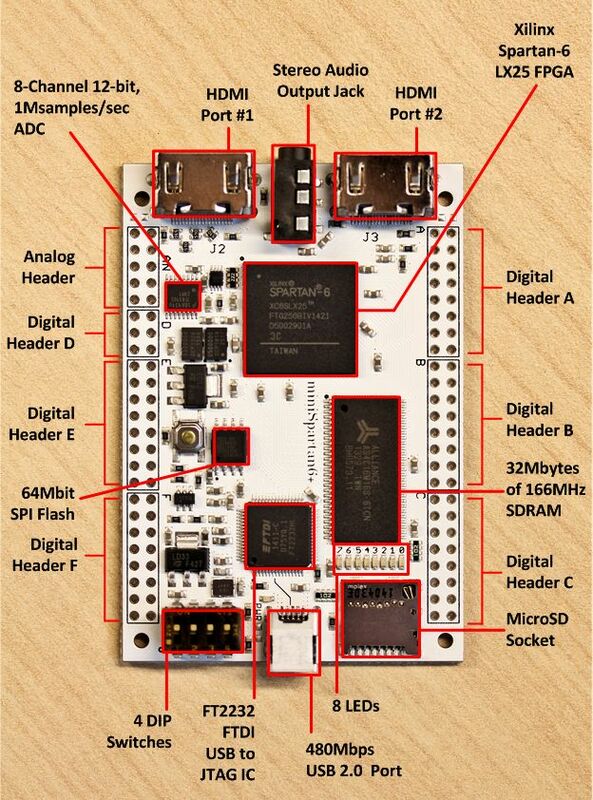 There is a full UCF available for the miniSpartan6+ here[https://github.com/scarabhardware/miniSpartan6-plus/blob/master/projects/miniSpartan6-plus.ucf], and we can use a subset of it for our uses. 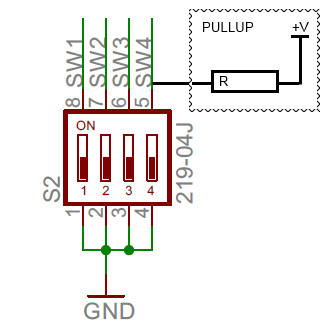 The PULLUP parts of the I_SWITCH definitions is very important. My first try at creating this file (before I found the full UCF file on github) omitted the PULLUP, which was never going to work. Without the PULLUP, regardless of the switch position, we’ll never get logic ‘1’ at the input. The hatched box happens inside the FPGA, pulling the value to ‘1’ when the switch is not connected to ground. Which is what you want! 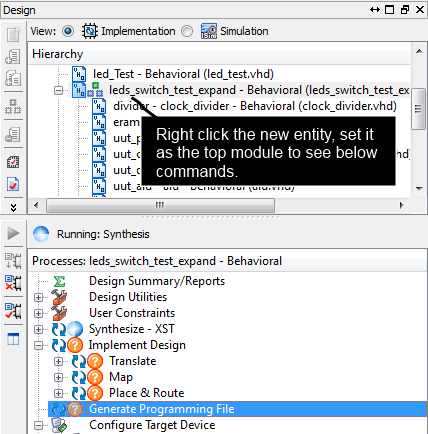 Translate – merges the incoming netlists and constraints into a Xilinx® design file. Map – fits the design into the available resources on the target device, and optionally, places the design. Place and Route – places and routes the design to the timing constraints. Generate Programming File – creates a bitstream file that can be downloaded to the device. The first time I flashed the FPGA, I was stumped as to why the LEDS were remaining on (apart from the reset LED). Then it became obvious. The clock input is 50MHz. There is no way, with the CPU running that fast, we can see the LEDs change! Using that divider, it works, and we get counting LEDS! I’ll put the full example top module on github (soon!) as an example, but there is more work to be done in getting it a bit more robust, making the memory mapping actually really mapped (at the moment, a write still actually happens in the RAM but we don’t care or break on it). For now, it’s pretty cool to see code actually running on a TPU on the FPGA hardware. Additionally, it only uses 3% of the slice resources of the LX25 Spartan6 FPGA, so lots more space to do other things with!